Over the past two decades, architects, engineers, designers and builders have made tremendous improvements in designing, building, and renovating homes. New homes today are far more energy-efficient and comfortable than in the past. All Renovation recognizes the importance of clean, fresh air indoors and of keeping chemicals and other pollutants to a minimum. We have learned how to build and renovate homes by using fewer natural resources and reducing the negative impact of housing on the environment. All Renovation is dedicated in building and renovating with a GREEN perspective. Let us demonstrate how a house of any age can be turned into a healthy, comfortable and energy-efficient home today. We encourage you to consider an Energy Efficient Home Renovation. You can start by downloading our Energy Efficient Home Renovation brochure. Goals: Determine the condition of the home and set priorities. Equipment inspection: heating, cooling, ventilation, hot water, etc. Goals: Save water and energy. Improve air quality. Think recycling. Goals: Save energy. Improve the air quality and reduce dust. Be resource-efficient. Think low maintenance. Increase comfort. Goals: Save energy. Control air quality. Minimize water contaminants. Goals: Control moisture and air quality. Eliminate mold. Save energy. Think comfort if basement is living space. Planning a full gut renovation project? Energy recovery ventilation systems provide a controlled way of ventilating a home while minimizing energy loss. They reduce the costs of heating ventilated air in the winter by transferring heat from the warm inside air being exhausted to the fresh (but cold) supply air. 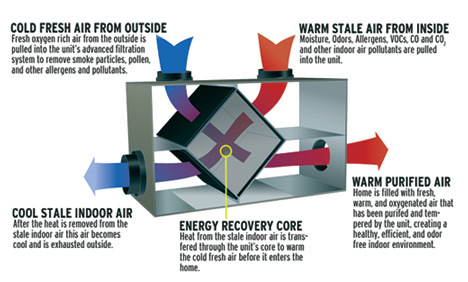 In the summer, the inside air cools the warmer supply air to reduce ventilation cooling costs. For more information, visit the U.S. Dept. of Energy website. Also you can visit our gallery to view our Passive House project which used this system. Download our Energy Efficient Home Renovation brochure.